Heads up, citizens: the federal government is about to review the endangered status of one of our state’s rarest species — the Florida panther — and now is the time for all of us to make our voices heard. We Floridians clearly love our wild and mysterious panthers. In 1981, the state’s schoolchildren chose the panther as our official state animal over other animal contenders like alligators and manatees. This U.S. Fish and Wildlife Service review comes at a time when panther deaths on Florida roads are outpacing the number of documented panther births. The statistics are alarming. Last year alone, an average of three panthers a month died on our roadways as they traveled in search of food and mates. So far, this year 13 panthers have been struck and killed on roads. These highway deaths come on top of other causes of mortality, including poaching, predation on kittens and disease. The road toll alone is too high to be sustainable. Every year since 2012, Florida has set a new record for the number of panthers killed by vehicles. Our panther population will face continual threats because massive new developments are planned for the southwest Florida lands that are the panther’s last home. Strip malls, housing developments, and new roads will all greatly impair Florida panthers’ prospects for survival. Panthers are particularly vulnerable to human threats due to their already low numbers and because they require large ranges. Biologists know that the leading cause of species extinction around the world is habitat loss and human persecution. With developers encroaching more dramatically in southwest Florida, the panthers need the protection the Endangered Species Act provides more than ever. We know too well how fragile our Florida panther population is. The cats were put on the Endangered Species list in 1967. In the 1990s, the population dwindled to just 20 to 30 cats before intensive rescue efforts began to save the species from extinction. The progress made in reviving their population should not be prematurely dismantled now. 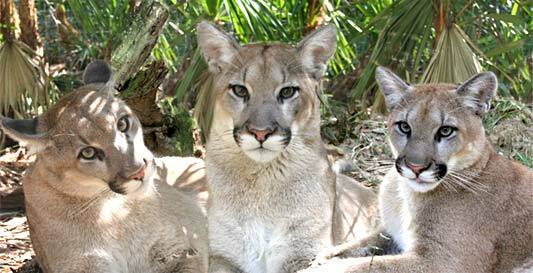 Unlike all other mountain lion subspecies, Florida panthers are specially adapted to their Big Cypress Swamp and Everglades habitats. How can you do something about this?